President Trump talks to the press about the table full of fast food laid out in the State Dining Room of the White House for a reception for the Clemson Tigers. It's a scene often observed in the White House. 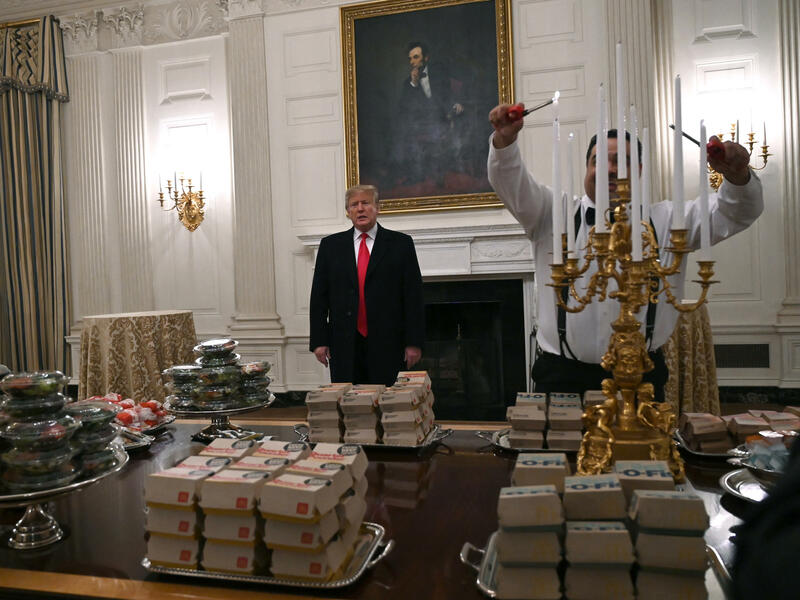 Men in bow ties light golden candelabras while the president of the United States stands behind a table containing small mountains of food on silver trays. But look closely, and you'll see the labels on the packages: "Quarter Pounder." "Filet-O-Fish." Chicken nugget dipping sauces sit in serving bowls off to the side. Behind the current president, Abraham Lincoln looks down, his hand on his chin, surveying the scene. If only paintings could offer witty commentary. In this case, we'll have to rely on late night comedians and Twitter observers, who roundly ridiculed President Trump for the feast he provided for the Clemson Tigers. Clemson beat No. 1 ranked Alabama to take the College Football Playoff National Championship and might have expected that a visit to the White House would command a dinner befitting a champion. Instead, the Tigers got a dinner befitting a drive-through customer — granted, on fancier plates. "I think we're going to serve McDonald's, Wendy's and Burger King with some pizza," Trump told reporters beforehand. "I really mean it. It would be interesting. And I would think that's their favorite food." Because of the shutdown, most of the staff in the White House residence had been furloughed, so Trump paid for the meal himself, he said. But Trump's magnanimity did not spare him from the biting tongue of Twitter. Cold McDonald's on expensive plates could not be any more perfect a representation of Trump. Commenting on a picture of the president posing with his hands wide in front of the feast, television writer Jess Dweck said: "This is the news photo that would make a returning time traveler realize they f***** something up." "Great American food!" Trump told reporters at an informal news conference before the meal. "And it could be very interesting to see at the end of this evening how many are left." He declined to say whether he prefers McDonald's or Wendy's. "I like 'em all. If it's American, I like it." Hey Clemson! Congrats on the game, AND the diarrhea!! Toward the end of his remarks, Trump pivoted to more traditional talking points. "We need border security," Trump said. "We have to have it. No doubt about it. It should have happened 30 years ago, 20 years ago, 10 years ago. And it's gonna happen now." Perhaps befitting Trump's hard stance on the southern border, it is not clear whether tacos were served at the gathering.